The farm shop will be closed on Christmas Day, boxing Day, and New Years' Day. Apart from those we will be open daily from 11am till 6pm. Please support your local growers and producers by doing your Christmas shopping at your local community farm! On Sunday 17th December we held a festive lunch at the farm, to which all our staff and volunteers were invited, with everybody asked to bring something, anything, to share. 15 people came along, including board members, local volunteers, and wwoofers, and brought with them (amongst other things) cauliflower cheese, chard and feta pie, roast veg, pumpkin soup, hedgerow wine, home-made ginger beer, crisps with dips, mandarins, apple crumble, local ice-cream, chocolates, fizz, cheeses etc...etc... Thank you to everyone who came and joined in, we all had a lovely afternoon! Let's hope that this is the start of a new tradition. On Friday 15th St Just celebrated a "festive Friday" as part of the run-up to Christmas, with Santa playing a barrel organ in the Square, a farmers and crafts market in the WI Hall, Pendeen Silver Band playing in the Square, the Christmas lights turn-on, a walking nativity with live animals, followed by a winter ceilidh in the Old Town Hall. Our stall at the evening farmers and craft market. Harvesting Chinese cabbage/leaves from the Sausage polytunnel. Small veg box (£6) - Chinese cabbage, savoy cabbage, potatoes, leeks, parsnips, Vietnamese coriander, and a pumpkin portion. Standard veg box (£10) - Chinese cabbage, savoy cabbage, potatoes, leeks, parsnips, a pumpkin portion, black winter radishes, Vietnamese coriander, celeriac, and chard. Two of our wwoof volunteers have recently returned home for Christmas (three are staying to share the festivities with us) - Marcello, from Italy, after 6 weeks, and Clement, from the French Alps, after one month. Marcello helping Otta wash-up after our festive lunch. Clement digging up leeks in the market garden. Many thanks to both Clement and Marcello for their help this winter, and we wish them both a merry Christmas back home. In the Mothership, just before pulling out the cucmber vines and some of the strawberries, with the Siberian kiwi having shed most of its leaves. In the Sausage, with a succession of headed lettuces, cut-and-come-again salad leaves, watercress, parsley, and oriental leafy vegetables. In Valentine, with crops of carrots and daikon (mooli radish) almost ready for harvesting, and some spring greens just gone in (following on from our pepper crop). In Nigel, full of a succession of winter salads. Fran, Alice and Herbie putting some finishing touches to the tree. The community farm's tree in the festival. Humpty Dumpty atop the farm's tree. St. Just's amazing and world-renowned Miner's Chapel (www.facebook.com/StJustMinersChapel) is once more holding it's lovely Christmas Tree Festival, this year with "nursery rhymes" as the theme. The community farm has chosen Humpty Dumpty for our tree, and thanks to all our volunteers who helped with the decorating, it looks superb. The festival is open every day from 2pm till 7pm until the 2nd January, with free entrance, and refreshments available. This is last Friday's standard £10 veg box, which contained purple sprouting broccoli, a cauliflower, kale, leeks, jerusalem artichokes, rainbow chard, a pumpkin portion, potatoes, and oriental greens. The small £6 box contained potatoes, kale, a pumpkin portion, beetroot, leeks, and a bag of mixed salad leaves. A selection of home-made cakes in the pop-up Cow Shed Cafe - it's not an open day without cakes! Rosie's food van serving gorgeous burgers in the farmyard (alongside Sonja's tombola and our newly reclaimed picnic benches). Crafts in the cob barn - making "all the king's horses and all the king's men" for the Miner's Chapel Christmas Tree Festival. Crafts and spontaneous festive singing in the cob barn. Meeting the chickens and collecting eggs. Eleven members of Pendeen Silver Band playing carols in the farmyard to end the day - wonderful. Many thanks to everyone who helped make our Advent Fair such a lovely experience - people who baked cakes or made soup, Rosie with her food van (and her sister Catrina who played cello in the cob barn), people who ran the crafts, Sophie who sold her jarred produce in the packing shed, everybody who sang or played an instrument served in the cafe or shop or took people to collect eggs or look round the polytunnels - and everybody who came on the day. Don't forget that we are holding our Advent Fair this Sunday 3rd December from midday till 4pm on the farm, with plenty to do and see and eat! The forecast is bright and dry! Tom and Linnea, who arrived from Canada by boat one month ago, will be leaving the community farm tomorrow after volunteering here for all of November. Heading under the mesh to pick kale. We'd all like to thank Tom and Linnea for their help over the past month, and we wish them all the best of things on their ongoing travels. Special thanks to Tom for his awesome potato digging song! Standard £10 - a whole squash, Swiss chard, Valor potatoes, a cauliflower, kale/greens, parsnips, leeks, rocket, and baby beetroot. Small £6 - a pumpkin portion, parsnips, potatoes, leeks, jerusalem artichokes, and kale/greens. 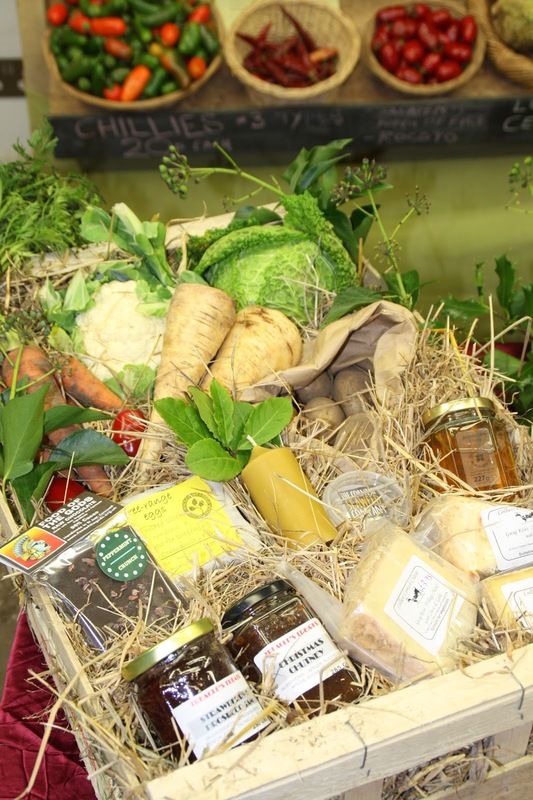 This Christmas we are offering three sizes of hamper - small £25, medium £50, large £75 - each containing a range of fresh veg and herbs from the farm, a stick of obligatory Brussels sprouts, our own free-range eggs, and a selection of festive treats from local artisan producers. They will be ready on Friday December 22nd, to be collected from the farm, or we can deliver to your door for only £1 extra if you live on our delivery round. Please contact us to order yours - 788454. One of our hampers from 2015. Photos from today's fair in St Just sports centre - many thanks to Fran and Lil, Alice and Herbie, for helping to run our stall, and to everyone who came to chat to and buy from us. Yesterday's small veg box (£6) - purple sprouting broccoli (from Cargease Organics), Cara potatoes, gem squash, pumpkin portion, red Russian kale, and Chioggia striped beetroot. Standard veg box (£10) - Cara potatoes, red Russian kale, pumpkin portion, leeks, beetroot, purple sprouting broccoli, cabbage, Chinese leaves, black radishes, and mixed salad leaves. Please contact us on vegbox.bcf@bcents.org to order yours. This is the last week that paper newsletters will be put into the veg boxes, the newsletters will be sent via email from next week. Can all our veg box customers please email their current email address to vegbox.bcf@bcents.org, thank you. A small group of players from Pendeen Silver Band will be coming to the farm on Sunday December 3rd to play festive music at our Advent Fair. The fair runs from midday till 4pm, and we anticipate music around the campfire in the farmyard at 3pm, or in the packing shed if cold/wet. At last, after seven winters of rushing to get everything packed before darkness, we have installed proper lighting in the packing shed! Many thanks to Andy for fitting the lights, and Chris for facilitating. Small veg box - Charlotte potatoes, chard, rocket, leeks, celeriac, and a pumpkin portion. Standard veg box - Charlotte potatoes, chard, rocket, leeks, celeriac, pumpkin portion, red Russian kale, gem squash, Jerusalem artichokes, a rocoto chilli, and a sprig of Vietnamese coriander. Picking chard for veg boxes - Joe, Linnea, Joan, Clement, and Andy. ...and seen through a polytunnel. Flo (Florian), from Pau in the south of France, left our farm on Wednesday to head to his next wwoof assignment near Falmouth. We'd like to thank Flo for his 6 weeks with us, and wish him well on his new farm. Our next wwoofer, Clement, arrived that evening, giving us just enough time to carpet, paint and clean the room between occupants. Phew. Small veg box, £6 - mixed salad leaves, jack-be-little squash, potatoes, kale, parsnips, and beetroot. Standard veg box, £10 - jack-be-little squash, potatoes, kale, parsnips, beetroot, oriental greens, leeks, pumpkin portion, and a cauliflower. I was topping the pasture on Saturday and just had to stop to take this photo - gorgeous! Clare helping to pick the final tomatoes from the dying vines that filled Imogen for the summer. We harvested over 400kg of tomatoes from her this season. Imogen cleared of tomato vines, weeded, forked over, and soaker-hose re-laid..
Municipal compost laid to form beds, ready for planting. Joe helping to plant winter crops - green sprouting calabrese/broccoli, cabalonero kale, purple pak choi, Chinese cabbage, purple kohl rabi, Italian parsley, coriander, komatsuna (Chinese spinach), lettuces, watercress, and French breakfast radishes. On Friday 17th November at 7pm, the film "Dying Breed" by Mark Catmull will be screened at Sancreed Village Hall. "A year in the making, shot on three small cattle farms in west Cornwall, Dying Breed is filmmaker Mick Catmull’s love letter to a disappearing way of life. The film paints a no holds barred, poignant, at times tragic portrait of three aging farmers seeing out their days with the knowledge that after their passing, their land will likely be sold off to big growers land speculators or city bankers fancying a bit of hobby farming. Dying Breed avoids the use of commentary. We hear only the voices of farmers, their families, and members of the Cornish farming community." Small box (£6, or £7 delivered to your door) - Valor potatoes, a portion of "winter luxury" pumpkin, red Russian kale, leeks, purple-top turnips, and peppers. Standard box (£10, or £11 delivered to your door) - all of the above plus "gem" squash, mixed salad leaves, oriental greens, and a sprig of Vietnamese coriander. All of the veg was grown on the community farm and picked fresh for the boxes. We are a not-for-profit community organisation relying on local and international volunteers. To join our veg box scheme, or to get involved on the farm, please contact us on 01736 788454. Clare and Jon picking the final tomatoes from Imogen before taking all the plants out. Jon and Clare, from England, spent six weeks living and volunteering as WWOOFers on the community farm until yesterday, and we'd like to thank them for all their hard work and smiling dedication during their time with us.